The Bourke Street Project is a post-rehabilitation living skills program for men recovering from problematic substance use. 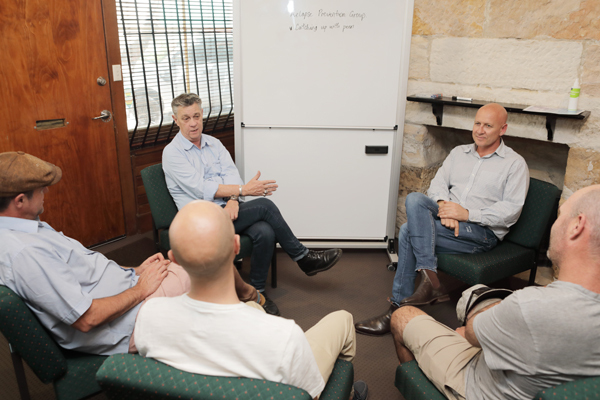 The service is located in the inner-Eastern suburbs of Sydney, with clients living in local transitional accommodation close to support services located at the Haymarket Foundation’s AOD offices in Cathedral Street, Woolloomooloo. The project supports men who are in recovery and at risk of homelessness with transitional accommodation, case management, counselling, therapeutic support groups, sports & recreation, living skills programs, and access to psychological services and relapse prevention programs. The service works using a transitional, three-stage model to help men with a desire to change their life by providing the emotional and practical skills required to reconnect with family and friends, enrol in educational programs, re-enter the workforce and ultimately live a fulfilling life in the broader community. Opening hours: The Bourke Street Project is available from 8:00am to 4:30pm, Monday to Friday (on-call service for residential participants in the program). Entry Criteria: The Bourke Street Project is available to men over the age of 18 who have been abstinent from all drugs and alcohol for at least 30 days prior to admission. Participants of the program must have completed and be accepted directly from a residential rehabilitation program. Accessing the Bourke Street project: You can contact the Bourke Street Project via a warm referral from your case worker from an external service, by calling the number below, emailing the service or by visiting our office in Cathedral Street. Admission to the program starts with an initial phone referral, followed by a face-to-face assessment with one of our case workers when a vacancy is available. Location: 140 Cathedral Street, Woolloomooloo, NSW 2011. Phone: Freecall 1300 029 202. This service is an initiative of the South Eastern Sydney Local Health District.